December’s declines were the steepest since 1931, with the Dow falling nearly 9%, and the worst Christmas eve on record. Developed markets, emerging markets, small company, and mid-cap company investments, which typically provide some diversification, were swept up in the dramatic sell-off. Bond and fixed income investments, however, delivered modest returns and some protection despite the headwinds of several Fed rate increases. Excessive fearfulness and, we believe, unwarranted negativity have taken hold of investors’ emotions and behavior. One sure indicator of this extreme is the unprecedented volatility. The S&P 500 was up or down by 1% or more 64 times during 2018, compared with 8 times in all of 2017. The looming fear of a trade war, punitive tariffs and their impact on consumer spending and corporate earnings, and a fractured and dysfunctional political landscape at home all combined in an ugly stew of pessimism. Markets indeed needed to adjust to a new reality, but reaction has been overdone, and we believe stock prices have reached an inflection point. The US economy remains strong, we are in the midst of a structural change in which innovation and industry disruption will bring accelerated corporate earnings, and the basis for solid investment returns going forward. Your balanced allocations among stocks, bonds, and cash has provided some insultation from the worst of the declines. Bond interest and dividend income are particularly important during market downturns, especially for those clients withdrawing on a regular basis. Markets move in cycles, and despite this ebb and flow, (which can at times be very painful,) have consistently gained value and produced wealth for our clients. The inevitable periodic retreats of the markets are always factored in to your allocation and your strategy. Your success is not a function of avoiding these declines, but to be prepared for them with appropriate allocation, and to be sure that your investments are properly positioned as markets recover, as they always do, and reflect in rising values the future growth and prosperity of the U.S. economy. 2018 began with optimism, and the ingredients for good stock market returns. Expectations were for 3 percent GDP growth, over 20% profit growth in the S&P 500, and tame inflation; this combined with acceptable, if not cheap valuations. However, after a surge in the first few weeks of January, we experienced the first of what would be four pullbacks of 10% or more. Historically, these price corrections have occurred on average only once a year! After a very muted 2017 where the largest decline was a mere 3 percent, 2018 saw volatility spike to levels not seen since the third quarter of 2015 when fears of Fed rate hikes and a slowing Chinese economy hit global stock markets. Who said history doesn’t repeat? The S&P 500 was up 11% at the closing high on September 20th and ended the third quarter with a gain of 10.6%. However, sentiment shifted dramatically heading into the fourth quarter, primarily due to tariff concerns, Brexit fears, the Fed rate worries, and the unstable political environment. The S&P 500 saw a pullback of 13.5% for the quarter including a gut-wrenching decline of 9% in December alone. 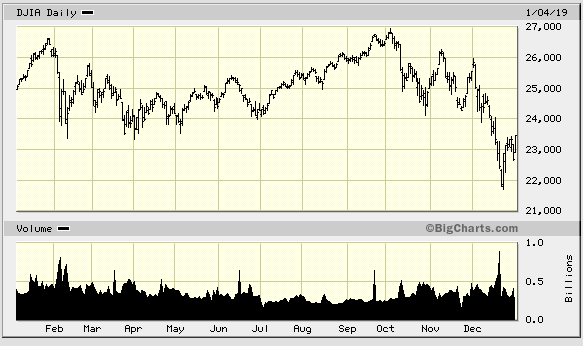 The Dow Jones Industrial Average finished the year with a decline of 3.5%, after losing 11.3% in the fourth quarter. The tech-heavy NASDAQ dropped 2.8% for the year and lost 17.3% in the fourth quarter; Apple, Netflix, Amazon, and Facebook all fell over 20%. There are many reasons to be sanguine as we head into 2019. U.S GDP growth is expected to moderate to the 2.0% range with inflation in the 2% area as well. A recession does not seem likely in the next twelve months and the Federal Reserve may slow, or even stop hiking interest rates. In addition, we are entering 2019 with expectations for earnings growth that could approach 8% and valuations well below the start of last year, leaving room for some modest P/E expansion. Unemployment is currently at its lowest point since 1969, with the potential to drive an increase in wages and an increase in consumer spending. U.S GDP growth is slowing, not collapsing. China, the second largest economy, is implementing supportive policies and is expected to expand at over 6% in 2019. India is projecting a growth rate at 7.4%, potentially surpassing the UK as the fifth largest global economy. These are healthy numbers that underpin the case for a 2019 recovery in stock prices in both developed and emerging markets. Fed rate hikes were a headwind for bond prices, but the Bloomberg Barclay’s Aggregate Bond Index finished flat (after spending the entire year in the red). From a current yield standpoint as of December 31st, the U.S. is the highest yielding non-distressed 10-year benchmark bond in the world at 2.73% versus Germany at 0.24%, the UK at 1.26%, France at 0.69%, Japan at -0.01% and Switzerland at -0.31%.